Yesterday, we took Shern for his fifth haircut since he was born. Yeah...already his fifth! 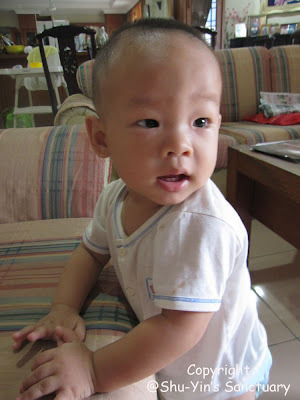 His hair grow very fast and it became too long and unruly since Shern has stiff and spiky hair! Anyway, this time around, it did not go very well. Shern was howling the whole time. Although the pretty miss that cut his hair is pretty efficient and fast, Shern was terrified of her and kept pushing his head away from her. So, in the end, Shern has got very short hair. Almost botak-like. I guessed she cut it too short this time, since Shern was being so uncooperative. Sigh. Will Shern still look like this on his birthday? haha. u r like me...like guys with short hair! shuey..muahaha. i think she also wish for a longer period of rest time b4 shern goes for his next haircut.